This work will be included in the forthcoming Auguste Rodin catalogue critique de l’oeuvre sculpté currently being prepared by the Comité Auguste Rodin at Galerie Brame et Lorenceau under the direction of Jérôme Le Blay. This relief, portraying a spirit whispering ideas into the artist's ear, has always been viewed as a symbolic representation of Rodin. The resemblance is in fact remarkable. Placed within the right-hand jamb of La Porte de l’Enfer, at the very bottom, this relief has been viewed as a kind of signature, like those left by the master-craftsmen of the Middle Ages. Lorenzo Ghiberti inserted his own self-portrait on the doors of the Baptistery in Florence, the main source of inspiration for La Porte de l’Enfer. Rodin also deeply admired Romanesque and Gothic art and, like his predecessors, was determined to use the available space as fully as possible. In this work, the figure is designed with creativity worthy of the artists of the Middle Ages and Renaissance, to fit it into the rectangular space allotted to it. 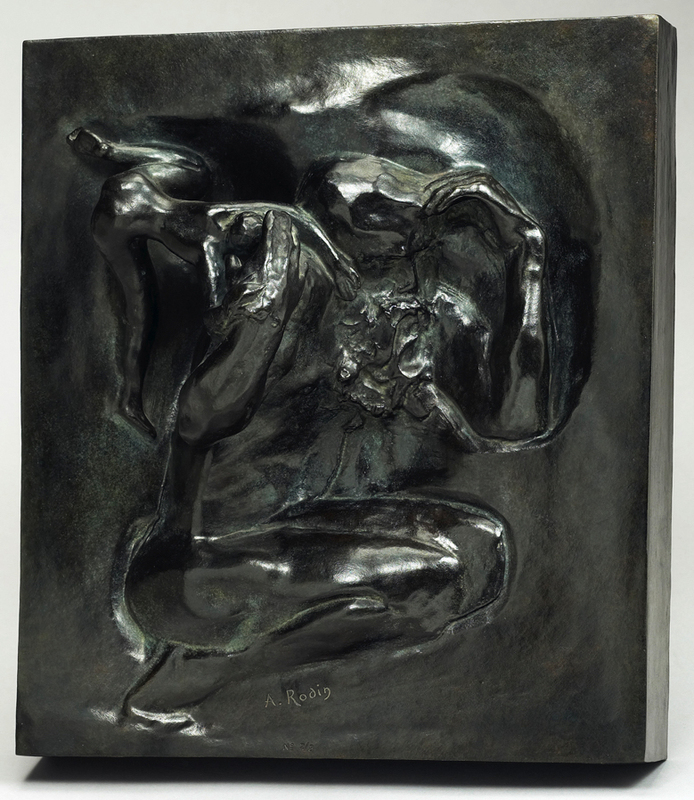 Although Rodin talked about artistic technique as a form of craftsmanship, the act of creation was always a mystery to him, and this little female figure whispering inspiration into the sculptor's ear is a representation that occurs several times in his work. In 1894-1895, this composition was remodeled in the round and entitled Le Sculpteur et sa Muse.